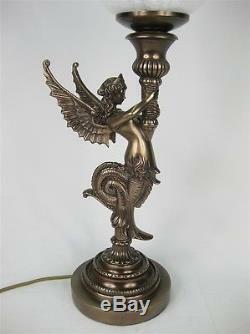 Beautiful bronze finished table lamps with glass shades. 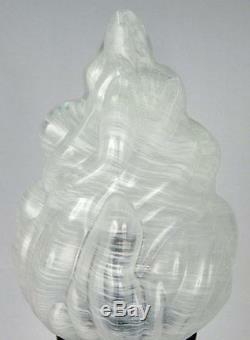 Made from Resin with superb detail and cast to a quality standard. 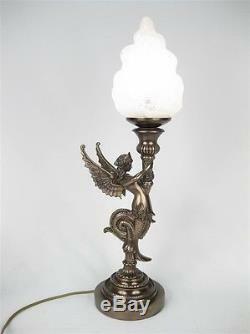 These exquisite figurine lamps will fit in any traditional or contemporary room setting. This item would usually only be available through a High Class Furniture or Lighting Shop. Ideal as a gift for a family member or friend on any occasion. Cable Length Approx 1.6/1.8m -With Inline Switch. 1 Pygmy Light Bulb SBC Max. Lamps have UK spec (3 pin plug, 220-240v) outside uk you will need a plug adaptor (not included). Brand New In Original Box -Assembly Required In order to give better service we check most items prior to dispatch. Olour may vary slightly due to lighting conditions when photographed. Special Offer - Price Includes 10% Pair Discount. All prices include Vat at the current rate. Free p&p for all additional eligible items. Add your items to your basket to receive postal discount. Our prices are fixed, we pride ourselves on. Sorry we do not accept offers. HIGHLANDS/ISLANDS OF SCOTLAND, OUTLYING AREAS & NORTHERN IRELAND DELIVERIES. This excludes certain large items and items that need to be delivered by pallet. Please check your area postcode. Deliveries to outlying areas may take a little longer. We know the rates to these areas are excessive on the small items but our contract is with DPD who apply this surcharge. All postcodes containing GY and JE. TR21 thru TR25 inclusive (only). AB36-38, AB55-56, FK17-21, G83, HS, IV, KA27-28, KW1-14, KW15-99, PA20-99, PH19-99, ZE. INTERNATIONAL DELIVERIES: PLEASE PROVIDE A CONTACT NUMBER. Our postal rates/services are for UK MAINLAND ONLY - We deliver to Europe (see exclusions). If you require an alternative address after ordering we will need to cancel your order and advise to re-order with preferred address selected. 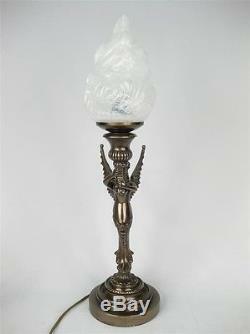 The company has been dealing in quality contemporary and reproduction items for over 25 years. Recycling/Packaging It is company policy to use recycled materials to pack your items wherever possible. We have invested in a cardboard shredding machine which reduces greatly the need for man made cushioning. After checking your items please recycle as much as you can. Our address - Middle England Number 1, Devon Street, Nechells, Birmingham, West Midlands, B7 4SL. Visit Our Showroom In Keswick Cumbria - Opening Hours 9.30am - 5.30pm 7 Days a Week Tel: 017687 75656. Poets Interiors The Old Poets Dining Room, Number 1 Packhorse Court, Keswick, Cumbria, CA12 5JB. 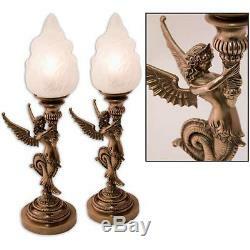 PAIR/ART DECO TABLE LAMPS BRONZE RESIN GREEK 56CM SERAPH FIGURINE GLASS SHADES. Choose from over 1000 different Gifts/Collectables and Home Accessories. 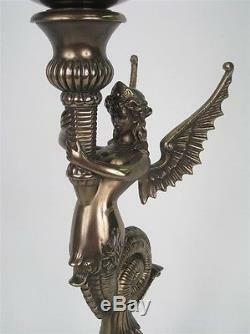 L'item "PAIR/ART DECO TABLE LAMPS BRONZE RESIN GREEK 56CM SERAPH FIGURINE GLASS SHADES" est en vente depuis le mardi 2 avril 2013. Il est dans la catégorie "Home, Furniture & DIY\Lighting\Lamps". Le vendeur est "middle-england" et est localisé à/en Birmingham. Cet article peut être livré en Europe.